Firefighters douse flames billowing from the roof at Notre-Dame Cathedral in Paris on April 15, 2019. A huge fire swept through the roof of the famed Notre-Dame Cathedral in central Paris on April 15, 2019, sending flames and huge clouds of grey smoke billowing into the sky. The flames and smoke plumed from the spire and roof of the gothic cathedral, visited by millions of people a year. A spokesman for the cathedral told AFP that the wooden structure supporting the roof was being gutted by the blaze. 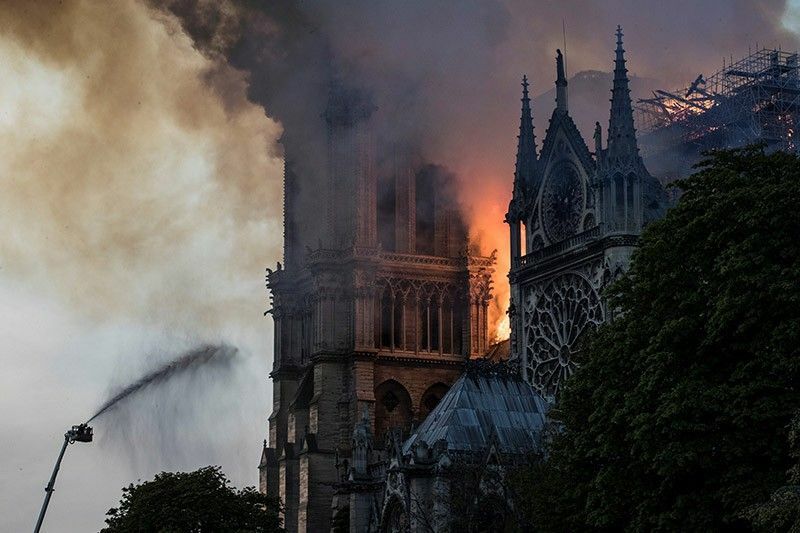 MANILA, Philippines — Malacañang said it was saddened by the fire that engulfed the historic Notre Dame Cathedral in Paris and expressed support for the French government's plan to rebuild the iconic landmark. "The Palace is deeply saddened and bothered by the fire that hit the Notre Dame Cathedral in Paris, France," presidential spokesman Salvador Panelo said in a statement on Tuesday. "Our thoughts and prayers are with the people of France as well as in solidarity with the rest of the world for this heartbreaking incident. We wish the French nation all the best as they undertake efforts to rebuild this great monument in Paris restored to its majestic sight," he added. Panelo called the cathedral "an architectural treasure," a "symbol of Catholicism" that housed several historical artifacts" and a "beloved icon." He noted that the cathedral was immortalized by French novelist Victor Hugo, author of the 19th century novel "The Hunchback of Notre-Dame." "Thousands of various races have at one time or another stood either by themselves or with their families or friends in front of this historic cathedral and marvel at its architectural grandeur," the presidential spokesman also said. "Their sojourn there left beautiful memories engraved in their hearts and recorded in photographs. Pain and sorrow were felt by the millions upon hearing the catastrophic fire of the Notre Dame place of worship," he added.